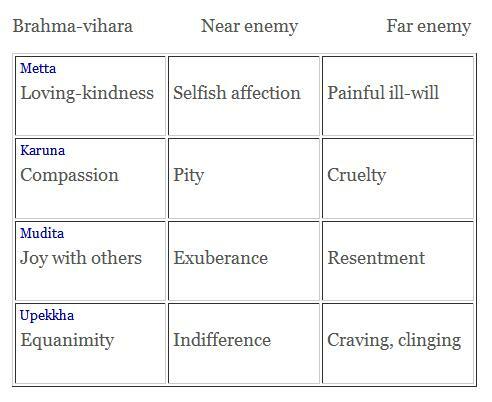 In Refuge Recovery, what we call the four Heart Practices of Kindness, Compassion/forgiveness, Appreciation and Equanimity are based on the four Brahma Viharas of traditional Buddhist philosophy, considered by to be the four highest emotions. The word brahma literally means ‘highest’ or ‘superior.’ It is also the name given to the supreme god in Hinduism during the Buddha’s time. Vihàra means ‘to dwell’, ‘to live’ or ‘to abide.’ So the Brahma Vihàras are not supposed to be emotions one occasionally feels, but those that one ‘lives in’ and ‘lives by’ all the time. Kindness, compassion, appreciation and equanimity can be understood as four related but separate qualities. Perhaps better, though, they can be thought of as four different ways the spiritually mature person relates to others according to their situation. So for example, we relate to friendly people with kindness, to those in distress with compassion, to the successful with vicarious joy and to unpleasant people with equanimity. The purpose of the heart practices is to encourage and nurture these four mental states. They are also known as the divine abidings or the divine abodes, and practicing regularly with them can enhance our sense of ease and of patience in our daily lives. Metta (loving-kindness) is a soft affection and care for others and yourself. It is distinct from the romantic type of love: it’s not the kind of love that includes extreme attachment or controlling feelings. Karuna (compassion) is an open-hearted sense of care for everyone. It includes empathy, being able to see the other person’s position and caring for and about them. Mudita (joy with others) is sometimes called sympathetic joy or appreciative joy. It is the ability to be happy when you see others happy. Their joy becomes your joy as you welcome less suffering and happiness in other people. Upekkha (equanimity) is a balanced state of mind that is neither clinging to pleasant states nor pushing away unpleasant ones. The Four Supreme Efforts and the Four Divine Emotions, like much of the Buddha’s teachings, could be summarized to the following two words: emotional intelligence. In 1995, Daniel Goleman published the best-seller, Emotional Intelligence. In this book he showed that more than intellectual intelligence, a far greater indicator of a successful life is how well they deal with social and emotional issues. Emotional intelligence refers to getting along with others, knowing how and when to act, not letting things bother you, and success features, such as persistence, determination, and deferred gratification. Dr. Goleman provides references from many studies to show the importance of the emotional skills for success. He explains how even residual amounts of anger (which some people feel are necessary to get the anger “off your chest”) leads to further, escalated anger. A person even with a small amount of anger can enter a “flooding” state, where there is an overwhelming amount of anger with adrenaline, where no rational decisions can be made in this state and it needs a long recovery time before settling down.Many people who have killed loved ones report that they “just snapped” in the heat of some arguments. Noah Levine, co-founder of Refuge Recovery, discusses the Heart Practices at Against the Stream Buddhist Meditation Society.